Joachim Peiper is, to say the least, a controversial historical figure. Peiper was undoubtedly one of the most ruthless and uncompromising panzer commanders of World War II. He was a convicted war criminal and received the death sentence (later commuted) for atrocities committed by his troops. Peiper's men were responsible for the slaughter of dozens of defenseless American prisoners at Malmédy. There was absolutely no excuse for that travesty, and those German troops should have been strung up. Everyone involved in the commission of that heinous act deserved the death penalty and should have received it. However, they did not due to post-war complications. That said, we shall focus here first on the military side of the equation of Battlegroup Peiper (Kampfgruppe Peiper), the outfit he led during the Ardennes offensive. That operation cannot be completely separated out from the war crimes, which is why we mention them prominently below. Peiper is seen in a chilling shot during the Ardennes Offensive. That appears to be a Schwimmwagen. The Allies held both Malmedy and St. Vith at this time, and eventually, the Wehrmacht took both. 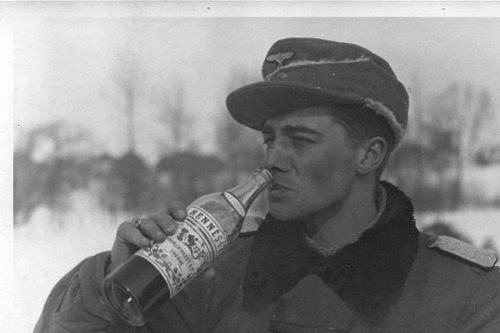 Joachim Peiper was a young SS crony of Heinrich Himmler, a product of the Hitler Youth. He had commanded combat outfits during some major battles, such as at Kursk, but had suffered some kind of emotional or mental breakdown during 1944. By December, though, Peiper had recovered and was put in charge of his own battlegroup, which was named after him. After numerous postponements, the offensive was given a final start date of 16 December 1944. Battlegroup Peiper was given a lead role. Road junctions were vital in the Ardennes since the trees prevented off-road travel. Most road junctions were in the middle of towns which the Americans could defend. This junction apparently was undefended, perhaps because of the speed with which Peiper got there. The Ardennes Offensive (Unternehmen Wacht am Rhein ("Operation Watch on the Rhine")) was a last-ditch German gambit launched after a period of relative quiet on all fronts during the last stages of World War II. It had virtually no chance of success, but the Germans (well, Hitler at least) figured it was at least worthwhile to try for a big victory rather than simply succumb to the inevitable squeeze between the Americans and the Soviets. Their success was real, but also ephemeral. "Wacht am Rhein" was renamed "Herbstnebel," a name chosen by Field Marshal Model, after the operation was given the go-ahead in early December. In the early morning of 16 December 1944, the King Tigers of the Schwere (heavy) SS-Panzer-Abteilung 501 moved through the village of Tondorf on their way to join Kampfgruppe Peiper for the initial attack during the Ardennes Offensive. Then, it was time to strike. The path of Kampfgruppe Peiper, 16-19 December 1944. A minor American offensive had been proceeding toward Falquemont and Colmar to the south of this operation from 12-16 November 1944. Allied operations also continued a bit to the north around Aachen by the US V Corps (specifically along the Hoefen-Alzen and Dreiborn ridges, about 5.6 miles (9.0 km) north of Krinkelt-Rocherath, Belgium - the battle became known as the Battle of Heartbreak Crossroads). There, the US Army planned to take the Roer River dams before proceeding further east (the German counteroffensive stopped that planned offensive). In the grand scheme of things, these Allied movements were small operations to set up later thrusts. Every Allied step forward took maximum effort, though, as the Germans were fighting hard on the German frontier and they knew the terrain. The rest of the front, though, had settled in for the winter and was relatively static. 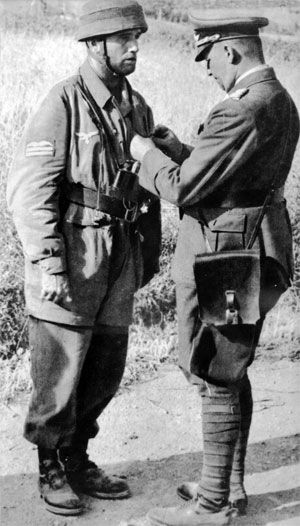 Fallschirmjaeger receiving his medal. These troops blew the hole in the American lines through which Peiper began his tank raid, at the cost of many of their lives. This quiet front changed abruptly at dawn (05:30) on the 16th of December when the German began a 90-minute artillery barrage. The 25-man U.S. Army 394th I&R platoon, under the command of Lt. Lyle Bouck Jr., occupied a critical road junction about 6 miles (9.7 km) southeast of Hünningen, near Lanzerath, Belgium. It was a small village (15 homes). Lanzerath was a big nothing on the map (and still is), but it gave access to the Losheim Gap and points further west. These men bore the brunt of the German offensive. Why such a small force was allowed to occupy such an important crossroads is a very good question, but they were there only to maintain communications between the 106th Division to the north and the 99th to the south. Basically, they were screening troops, perhaps unaware that nothing stood between them and the entire Wehrmacht. As always seems to be the case after the fact, "they were about to be relieved." To be candid, the Americans were overconfident and felt that all was left to the war were mopping-up operations. The 106th was staging a small penetration of the Siegfried Line at Wehlerscheid (which was the spot of nothing more than a forester's cabin) about five miles north of Rocherath and was looking in that direction, so the 394th basically was on its own. Well, not for long, as the Germans had a much better use for Lanzerath than the Americans and soon gave the American platoon a bit of company. 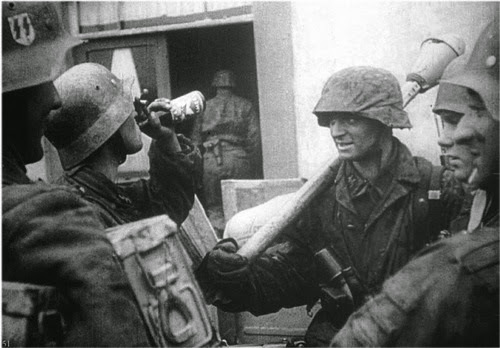 Fallschirmjaeger. I don't have a date or place for this photo, apparently Italy. Fallschirmjaeger units were established early in the war as elite troops with special training. After Crete, Hitler decided to use them mostly as ground troops (though, in Sicily and a few other places, they were inserted by air drops to good effect). The original orders to establish them, however, were never countermanded, so the Fallschirmjaeger units gradually grew in size and importance within the German war effort despite being unnecessary for their original purpose - airborne operations. Fallschirmjaeger were extremely efficient and capable and were equipped differently than standard army troops. 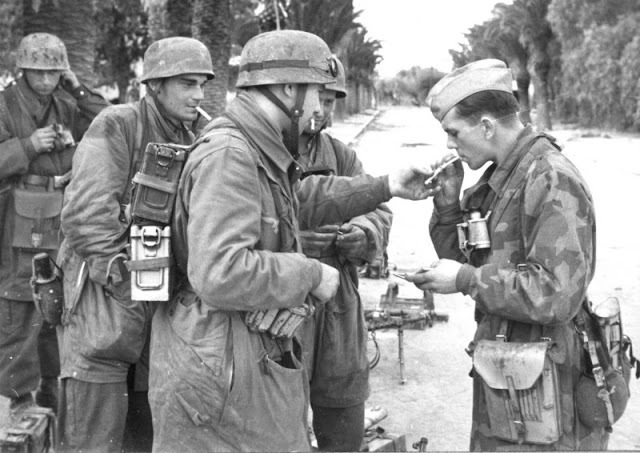 Smoking like that, incidentally, was a common Wehrmacht symbol of self-confidence and success, which is why a lot of propaganda photos of men "lighting each other up" were taken. 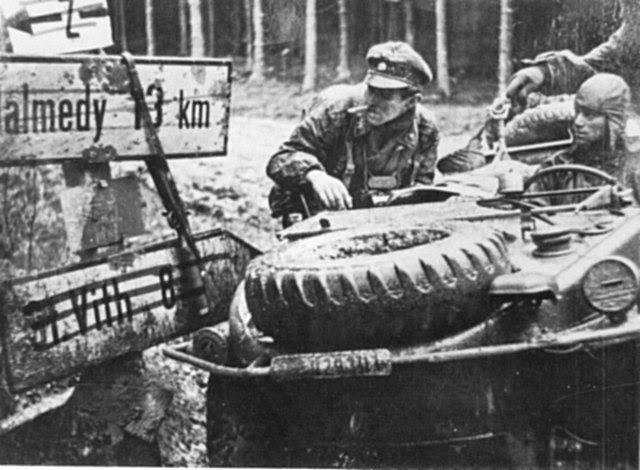 Sepp Dietrich positioned Kampfgruppe Peiper in the forest around Blankenheim just east of Lanzerath. 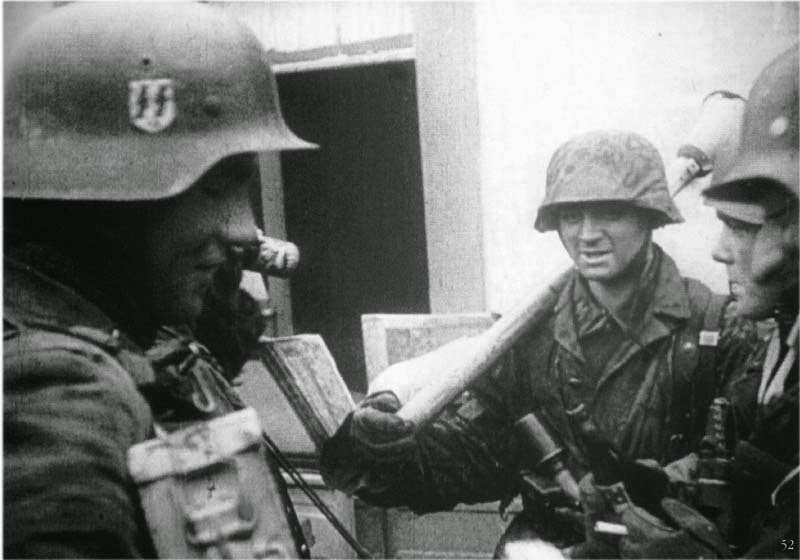 After the barrage, at 08:00, it was light and the Americans didn't like what they saw: a 500-Fallschirmjäger (1st Battalion, 9th Fallschirmjaeger Regiment, 3rd Fallschirmjaeger Division, elite troops) column heading for them. Before the Americans could escape, the Germans had entered the town. Bouck was trapped with his men as the lead Germans walked by, then he and his men popped up and started blasting. The Germans came on across an open field, and the men of the 394th mowed them down. They also deterred another attack at 11:00. The Wehrmacht troops were poorly trained, but there were a lot of them. At 15:00, a third attack resulted in hand-to-hand combat. The 394th held out until dark, but their ammunition was running low. The Germans infiltrated past the town on either side. Bouck contemplated withdrawing, but the Germans beat him to the punch and got to his position before he could pull out. The Germans captured all of the surviving Americans (one death and 14 wounded). The Americans earned a lot of medals - the most of any American unit, in fact - but the could not hold in the face of the frenzied German charges, which resulted in heavy casualties of their own. This self-destructive attack gave Peiper, waiting in the woods, his opening. He and his men started their engines and headed for Lanzerath. Peiper's men did take prisoners when it wasn't too inconvenient. During the Ardennes Offensive, Kampfgruppe Peiper was boosted by the King Tiger tanks of the Schwere SS-Panzer-Abteilung 501 (heavy tank battalion) for its drive westwards in an attempt to reach the Meuse River. Here, one of its tanks passes a column of captured soldiers from the US 99th Infantry Division on 17 December 1944. 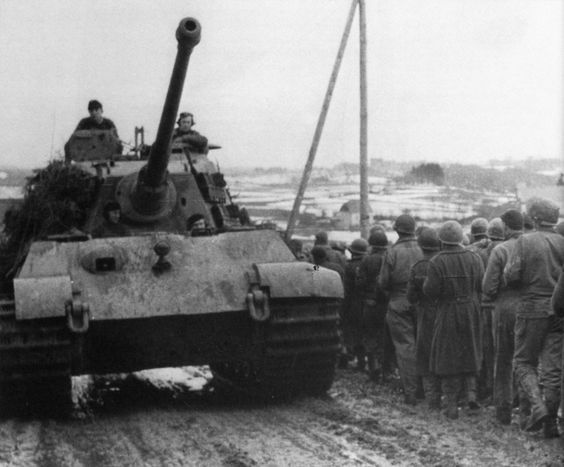 The village of Merlscheid lies in the background and the King Tiger is on its way towards Lanzerath for the breakout. The rest of the German Ardennes Offensive was stuck, particularly at the famous battle of Elsenborn Ridge. Battlegroup Peiper, part of Sepp Dietrich's 6th SS Panzer Army, was the only mobile group that had a clear breakthrough, and thus was at the fore of the entire advance. Peiper knew how to exploit an opening. "The eyes of Germany are upon you," Peiper was told in an official message. The offensive had a very strict (and unrealistic) timetable for places to occupy by certain times if there was to be any chance of ultimate success. Peiper intended to keep to that timetable. Peiper was far from the only Panzer commander with his own battlegroup. Here, a Panzergrenadier from Kampfgruppe Hansen stands along the wreckage of the American 14th Cavalry Group. It had gotten fallen into an ambush and been destroyed on the road between Poteau and Recht on the morning of 18 December 1944. Out of the entire German Heer, only Battlegroup Peiper managed to adhere to the timetable for any length of time, or at least not fall too far behind. The Germans made good progress and daily advances were measured in kilometers whereas for months the Wehrmacht hadn't been making any progress at all. The Kampfgruppe rolled westward, passing through Bullingen and Ligneuville. Along the way, it picked up some American stores of gasoline that were badly needed. This, incidentally, was a key part of the German plan, to use captured supplies to continue rolling westward. 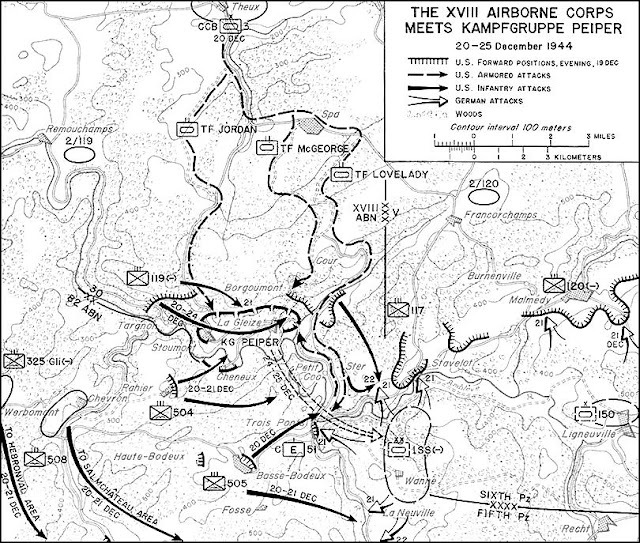 The offensive was in full swing on 17 December 1944, but even then, the second day, it was behind schedule. Fighting in the Ardennes with armored troops was almost equivalent to a naval battle: everything depended upon subduing islands of resistance at isolated crossroads towns. Bastogne was at one such crossroad, and it was never captured; Malmedy (or rather about five miles (8 km) south of there, at the Baugnez Crossroads, where five roads intersected) was another. US soldiers of Battery B of the 285th Field Artillery Observation Battalion, a lightly armed technical unit, were retreating from Malmedy south through the crossroads. The location is always referred to as Malmedy, but in actuality, it was along the road between Bullingen and Ligneuville, about 8 km (5 miles) from Malmedy. 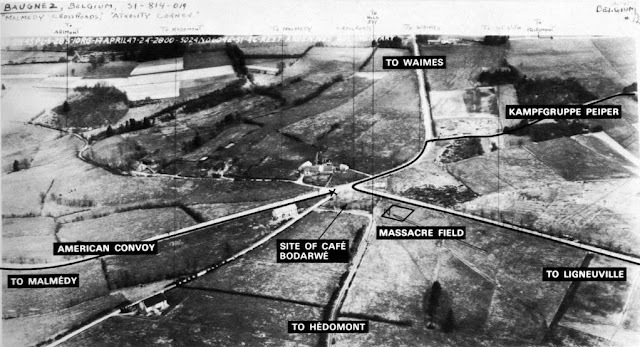 The aerial photo taken shortly after the incident shows the layout, with Peiper coming out of the trees at the upper right. 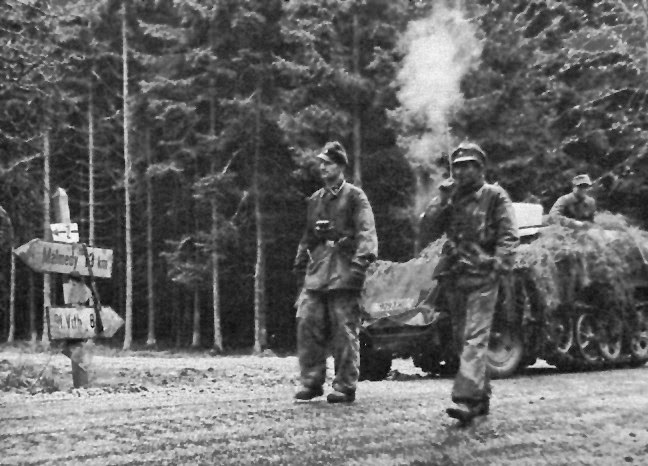 Peiper (right center, blowing smoke) led his troops personally near Malmedy. Peiper came across this an ordinary US convoy of jeeps and trucks, with an MP directing traffic. Nobody knew where the Germans were, but everybody knew they were on the way. It is safe to say that they had no idea the German panzers were so close. Peiper's men suddenly erupted out of the woods from another road and a fierce battle ensued. When some of the out-gunned Americans took refuge in a tavern, Peiper's men set the building on fire. Resistance ended quickly, as it was men with rifles against German tanks. Peiper was on the scene, but he was pressed for time and troops. He had his men stand the surviving Americans in a snowy field next to the burned-out tavern. As guards, Peiper left only a few SS troops, including some non-German ones. Then, Peiper and his convoy left and headed down the road for Ligneuville and, later to Stavelot. After a sequence of disputed events, 72 American POWs were dead in the snow Malmedy. As discussed below, this incident was to haunt Peiper. After the incident just south of Malmédy, the Kampf Gruppe reached Stavelot, where it ran into its first serious opposition. The spearhead then made its way along the Ambleve toward the towns of Stoumount, La Gleize, and Trois Pontes. The Meuse was the ultimate objective, and now it was not far off and less than 20 miles. Panthers from Kampfgruppe Peiper moved forward into Stoumont to support the Panzergrenadiers who arrived there first on the morning of 19 December 1944. By 10:30 a.m., Peiper was in firm control of Stoumont. He then attempted to push further westward to seize a bridge west of Stoumont. American engineers blew the key bridge at the last minute, preventing a breakout toward the Meuse, where the Kampf Gruppe intended to seize a bridge for the rest of the German offensive. The ultimate objective of Antwerp would then be within range, but Peiper had other problems by this time, as American resistance was growing. The Kampfgruppe was intact and deadly. However, the rest of the Sixth SS Panzer Army was stuck far behind at Elsenborn Ridge. That turned Peiper's operation into an unsupported tank raid. The entire German offensive was stalled while it chewed away at key road junctions in the rear such as St. Vith and Bastogne. Peiper had to resort to an air supply, which was difficult in the overcast skies. The only saving grace was that the bad weather kept the Allied planes grounded, which was the only thing that enabled the Kampfgruppe to continue forward at all. At La Gleize and Stavelot the Kampfgruppe reached a dead end, blocked by the river. 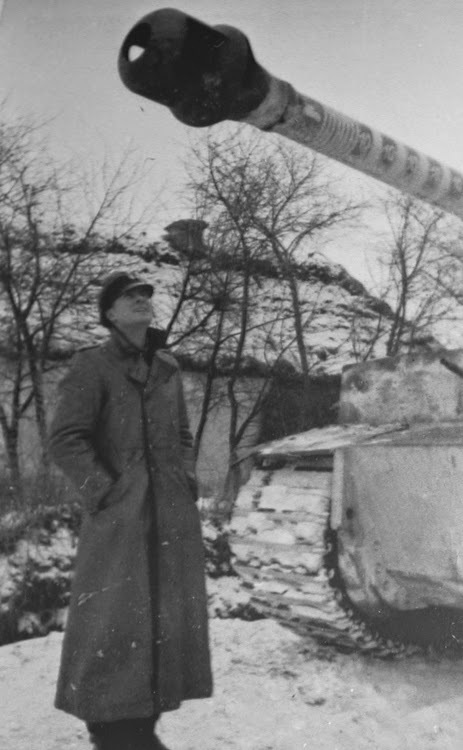 By 19 December 1944, without bridging equipment, Kampfgruppe Peiper had nowhere to go. It found itself alone and ultimately surrounded. American forces closed in. If the rest of the Wehrmacht had followed up, Peiper's advance still would have been a brilliant strategic success, but it was still reducing American strongpoints far to Peiper's rear. Thus, it can be correctly stated that Battlegroup Peiper did not outrun the rest of the army; instead, the rest of the Wehrmacht fell behind Battlegroup Peiper. Battlegroup Peiper had the very best equipment that the Third Reich ever produced. It was supplied with King Tigers, Panthers, amphibious jeeps, and other armored vehicles which had no peer during the war. All were battle-tested and at their maximum peak of efficiency. The opposing scattered Sherman Tanks of the Americans posed no serious hindrance to this imposing armada - as long as the panzers had fuel and the men had food to eat. 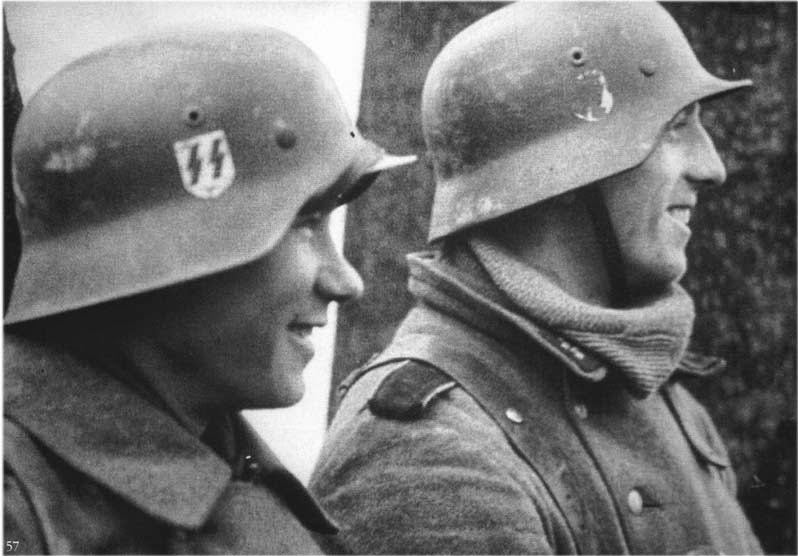 The soldiers of Battlegroup Peiper were in good spirits. The men were happy to be back on the offensive after months of constant retreat. Peiper's troops made good advances, pushing through Stavelot, Belgium. They almost reached the key town of Dinant on the Meuse. At their farthest point of advance, the Germans came within about 20 km of the Meuse River, some advance scouts a bit closer, perhaps even within 8 km of the thinly held Allied line at the Meuse. However, getting a few people that far is not the same as saying you "made it there" - anyone can walk through the woods to a certain point and "claim" it. Controlling the area for some useful purpose is entirely another matter. This, Battlegroup Peiper failed to do. 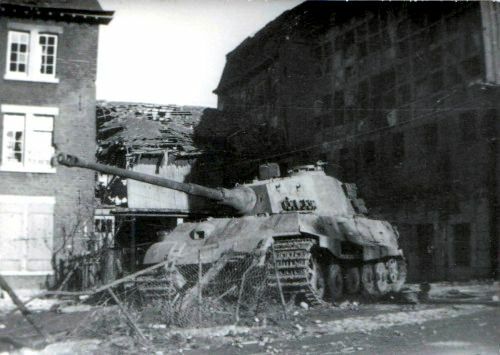 A King Tiger from Kampfgruppe Peiper, 1st SS Panzer Division abandoned at Stavelot, Belgium. If Peiper had been able to reach the Meuse and seize a crossing there, it might have drawn off enough Allied forces to allow the Germans behind him to catch up. However, with no support and running out of fuel, he had no chance. Peiper ultimately was forced to abandon his immobile tanks and retreat on foot back to German lines with his men. The destruction of Kampfgruppe Peiper. By 25 December, Peiper and his men were walking back to Germany. The retreat itself was a success, especially considering that Peiper got his formation back to his own lines intact (although Peiper's unit took horrible losses), but his retreat also ended any chance the Germans had of succeeding with their offensive. Only a small fraction of Peiper's original force made it out. After that, the entire Ardennes Offensive petered out and Germany surrendered a few months later. Tank raids were not unusual during World War II. They had been happening for years, particularly on the Eastern Front. However, Peiper's tank raid received a lot of publicity. Peiper faced trial for war crimes after the war, and the most publicized charges were those concerning the incident near Malmedy. There are two versions because there were two very distinct groups of people who gave their accounts later: the SS guards, and the surviving POWs. The guards claimed that one or more prisoners made a break for it; a guard fired a warning shot or two, and then the prisoners all ran for it at once. The guards then claimed that they "had" to perpetuate what came to be known as the Malmédy Massacre. Pvt. 1st Class Georg Fleps, a Waffen-SS soldier from Rumania, was identified as the first Wehrmacht soldier to fire a shot. What the few SS men were supposed to do with the American POWs in the field if they hadn't shot them was never explained, as there was no means of transport to take them to POW camps. Basically, they all simply stood face to face with each other. Then, things happened. The prosecution painted a far different picture. There was a spirit of lawlessness in Peiper's troops, and there was testimony that he had told his men to take no prisoners (exactly what that meant was disputed at trial). The few (3) surviving American POWs testified that their German guards just waited until Peiper was out of sight and then started firing. There was no provocation, they claimed, and they offered no provocation or resistance to their captors. Within a matter of moments, 72 POWs were dead without cause. The court believed the account of the American POWs and sentenced Peiper to death. The majority of the murdered US GIs were eventually shipped back to the States for private burials. Twenty-one, though, still lie buried in the American Military Cemetery at Henri-Chappelle, about forty kilometers north of Malmédy. The Malmedy massacre was not the only alleged war crime incident involving Peiper's men during the Ardennes offensive. In fact, Battlegroup Peiper was accused of murdering between 538 to 749 nameless Prisoners of War and more than 90 unidentified Belgian civilians during the operation. Those incidents, however, have not received as much publicity and apparently were not thoroughly investigated at the time. "It's so long ago now. Even I don't know the truth. If I had ever known it, I have long forgotten it. All I knew is that I took the blame as a good CO should and was punished accordingly." Some accounts place Peiper miles away throughout the entire incident and having nothing to do with it. However, the court found him at the head of the column and in direct control of what took place. Peiper was in prison for about a decade. A Panther commander of the Kampfgruppe Peiper urges some prisoners out of his path as he negotiates the narrow village street of Stoumont, Belgium on 19 December 1944. Peiper himself evaded the death sentence imposed upon him afterward due to the Malmédy affair. Why is somewhat murky, but the Allies showed leniency to many former Wehrmacht soldiers in the 1950s. Peiper now had his freedom, but then experienced all sorts of difficulties adjusting to civilian life - understandably, some people opposed the presence in their work site of a convicted war criminal. Peiper had trouble holding a job but evaded any further trouble with the law. Peiper lived in relative obscurity for decades but got by. Finally, in 1976, Peiper unwisely raised his profile and gave an interview about his war experiences to a French journalist. Incredibly, Peiper had chosen to live in France, where he was accused of having committed atrocities. The locals knew he was there and harassed Peiper, but he and his family disregarded their threats. 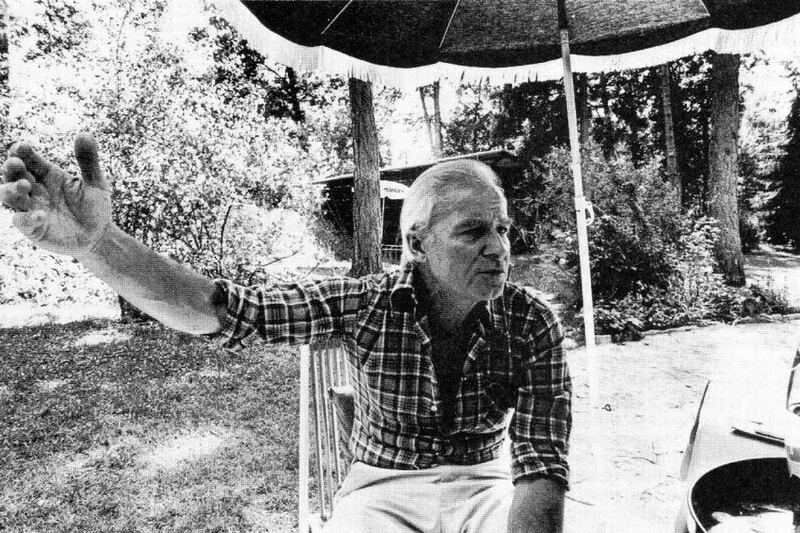 Peiper in 1976, giving his final interview. This 1976 interview brought attention to Peiper that did him no good. The locals resented having a convicted war criminal living near them and wanted to remove Peiper. Peiper knew all about their wishes - they painted signs on the road near his house warning people away, that sort of thing - but Peiper was obstinate: he stayed put. He was prudent, though, and sent his family away to stay in Germany while he awaited events he knew were coming. One night in July 1976 - Bastille Day - Joachim Peiper's house burned down and he was found dead in the wreckage. The Germans' objective was not Rotterdam, as you state, but the port city of Antwerp. Yes, of course you are correct. I put in Rotterdam as a kind of placeholder whilst drafting because Antwerp for some reason did not spring immediately to mind, then never went back to correct it. I'm sure they would have loved getting to either place. ;) Anyway, many thanks for the correction, very nice to know that readers are going through these articles as carefully as you and others do. "In the early morning of 16 December 1944.. The Kampfgruppe blasted through the thinly held American lines. The panzers faced mostly infantry guarding a secondary sector"
Wow you skipped right over the Battle of Lanzerath Ridge, which earned the 394th I&R Platoon of the 99th Division the most decorations for a single action in WWII! They fought to the last bullet even while the 14th Cavalry retreated around them, causing an 18 hour delay in Peiper's planned assault. You did show the picture of the POWs though. I wonder if he did not execute those who held their lines in battle? It was believed he was not shot but died of smoke inhalation, as well no cartridges were found outside his home indicating no shot were fired outside.